I have to admit that I have a special fascination with obscure devotions in the Church that have largely fallen out of practice. It is like discovering a hidden mine, full of gold! After all, these children of Bethlehem – these murdered children – were the first Christian martyrs. That has to mean something. That has to mean a lot. The Church thinks so – the feast of the Holy Innocents is celebrated on December 28. Some biblical scholars have questioned whether the massacre of the Holy Innocents (as related in Matthew’s Gospel above) is more of a midrash than literal history, and yet we know from genuine historical sources that Herod was a ruthless madman who even killed his own sons. “Extrabiblical history paints a similar [Biblical] portrait of Herod; he murdered his favorite wife, three of his sons, and others who threatened his throne” (Ignatius Catholic Study Bible, p.10). 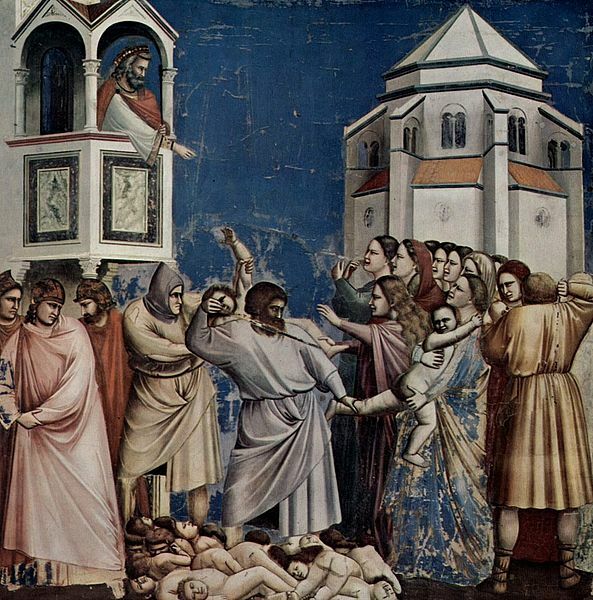 “The number of these children was so small that this crime appeared insignificant amongst the other misdeeds of Herod” (Catholic Encyclopedia). Scripture scholar Scott Hahn adds that Herod “slaughtered Jerusalem priests whose scriptural interpretations made him anxious, and his other sporadic purges claimed victims by the hundreds” (Joy to the World, p.138). “The two chapters of Matthew’s Gospel devoted to the infancy narratives are not a meditation presented under the guise of stories, but the converse: Matthew is recounting real history, theologically thought through and interpreted….” (Pope Benedict XVI). Add to this the testimony of a great saint regarding the efficacy of this particular devotion and you have ample reasons to practice it! A gifted spiritual writer, F.W. Faber, relates the following: “The revelations of the Saints also tell us of the singular power now accorded in Heaven to these infant Martyrs, especially in connections with death-beds, and St. Francis of Sales died reiterating with marked emphasis and significance the invocation of the Holy Innocents” (Bethlehem, p.198). Of these infant martyrs Faber states: “They were [Jesus’] companions in nativity, His mates in age and size; and though it was no slight thing to have these natural alliances with Him, by grace they were much more, for they were likenesses of Him, and they were His Martyrs” (Id). “The Church has always held the firm conviction that those who suffer death for the sake of the faith without having received Baptism are baptized by their death for and with Christ. This Baptism of blood, like the desire for Baptism, brings about the fruits of Baptism without being a sacrament” (Catechism of the Catholic Church, 1258). Faber relates that this devotion has a special relationship to Mary and to growth in the virtue of purity. “A twofold light shines in the faces of this infant crowd, the light of Mary and the light of Jesus. They resembled Mary in their sinless purity; for even if our Lord had not constituted them in a state of grace before, their Original Sin would be more than expiated by their guileless blood, when it was shed for Him. It was a fearful font, a most bloody sacrament…. They were like Mary in their Martryrdom for Jesus, as all the Martyrs were; but they were like her also, in that their Martyrdom was as it were the act of Jesus Himself….It is only more remotely so with the other Martyrs. This is one of their distinctions. They resembled her also in their nearness to Jesus. They were among the few who were admitted into the hierarchy of the Incarnation” (Bethlehem, p. 198). “These infant Martyrs represent also what must in its measure befall everyone who draws near to Jesus. Suffering goes out of him, like an atmosphere. The air is charged with the seed of crosses, and the soul is sown all over with them before it is aware. Moreover, the cross is a quick growth and can spring up, and blossom, and bear fruit almost in a night, while from its vivacious root a score of fresh crosses will spring up and cover the soul with the peculiar verdure of Calvary. They that come nearest to our Lord are those who suffer most, and who suffer the most unselfishly” (Bethlehem, p.198). CONCLUSION: An intense, mysterious, supernatural aroma hovers over our devotion to the Holy Innocents, teaching us to “manage our sorrows” and sufferings according to “supernatural principles”. Certainly this devotion teaches us that there is “no solid peace to be found among the perishable things of this life.” This devotion seems to focus light and grace in three areas: it has a special efficacy for the dying; it helps us to grow in purity and in devotion to Mary; and finally it teaches us to value and see all our sufferings in a supernatural light. All of the Holy Innocents lived less than three years, but now they live in the glorious splendor of an untiringly joyous eternity! Praise be Jesus Christ! Now and forever. Amen. References: All the quotes in the conclusion are from Faber, so you can see I am relying on him for the conclusion; and it is Faber who writes in one of his books about an “untired eternity.” Pope Benedict XVI defends the historicity of the Infancy narratives of Matthew and Luke in his series of books, Jesus of Nazareth. See page 119: “The two chapters of Matthew’s Gospel devoted to the infancy narratives are not a meditation presented under the guise of stories, but the converse: Matthew is recounting real history, theologically thought through and interpreted, and thus he helps us to understand the mystery of Jesus more deeply” (The Infancy Narratives, Image).